Governor of Khyber Pakthunkhwa at a special impressive ceremony held here at Governor House on Wednesday afternoon. 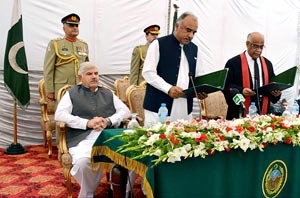 Chief Justice, Peshawar High Court, Justice Waqar Ahmed Seth administered the oath to the new Governor. attended the oath-taking ceremony in large number. The appointment order of the new Governor was readout by the Chief Secretary Kamran Naveed Baloch before national anthem was played. On August 16 last, Shah Farman was nominated by Prime Minister Imran Khan for the coveted post. Jhagra on August 17, 2018. Earlier, the oath taking ceremony of KP Governor was delayed due to Presidential Election in the country. Shah Farman has tendered resignation from PK-71 seat of Peshawar after casting his vote in the Presidential Election yesterday. The oath taking of new Governor has completed political set up in the province.